Dr. Katrin Glatzel is Policy & Research Officer at Agriculture for Impact, which acts as the convenor for the Montpellier Panel. KIGALI, Rwanda, Jun 14 2016 (IPS) - After over a year of extreme weather changes across the world, causing destruction to homes and lives, 2015-16 El Niño has now come to an end. This recent El Niño – probably the strongest on record along with the along with those in 1997-1998 and 1982-83– has yet again shown us just how vulnerable we, let alone the poorest of the poor, are to dramatic changes in the climate and other extreme weather events. Across southern Africa El Niño has led to the extreme drought affecting this year’s crop. 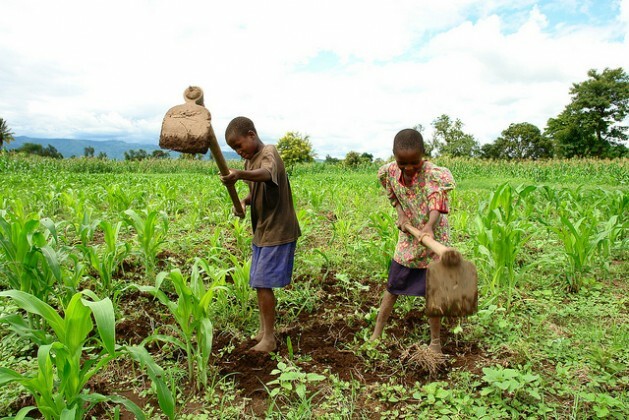 Worst affected by poor rains are Malawi, where almost three million people are facing hunger, and Madagascar and Zimbabwe, where last year’s harvest was reduced by half compared to the previous year because of substantial crop failure. However, El Niño is not the only manifestation of climate change. Mean temperatures across Africa are expected to rise faster than the global average, possibly reaching as high as 3°C to 6°C greater than pre-industrial levels, and rainfall will change, almost invariably for the worst. In the face of this, African governments are under more pressure than ever to boost productivity and accelerate growth in order to meet the food demands of a rapidly expanding population and a growing middle class. To achieve this exact challenge, African Union nations signed the Malabo Declaration in 2014, committing themselves to double agricultural productivity and end hunger by 2025. However, according to a new briefing paper out today from the Montpellier Panel, the agricultural growth and food security goals as set out by the Malabo Declaration have underemphasised the risk that climate change will pose to food and nutrition security and the livelihoods of smallholder farmers. The Montpellier Panel concludes that food security and agricultural development policies in Africa will fail if they are not climate-smart. Smallholder farmers will require more support than ever to withstand the challenges and threats posed by climate change while at the same time enabling them to continue to improve their livelihoods and help achieve an agricultural transformation. In this process it will be important that governments do not fail to mainstream smallholder resilience across their policies and strategies, to ensure that agriculture continues to thrive, despite the increasing number and intensity of droughts, heat waves or flash floods. The Montpellier Panel argues that climate-smart agriculture, which serves the triple purpose of increasing production, adapting to climate change and reducing agriculture-related greenhouse gas emissions, needs to be integrated into countries’ National Agriculture Investment Plans and become a more explicit part of the implementation of the Malabo Declaration. Across Africa we are starting to see signs of progress to remove some of the barriers to implementing successful climate change strategies at national and local levels. These projects and agriculture interventions are scalable and provide important lessons for strengthening political leadership, triggering technological innovations, improving risk mitigation and above all building the capacity of a next generation of agricultural scientists, farmers and agriculture entrepreneurs. The Montpellier Panel has outlined several strategies that have shown particular success. A “knowledge economy” improves the scientific capacities of both individuals and institutions, supported by financial incentives and better infrastructure. A good example is the “Global Change System Analysis, Research and Training” (START) programme, that promotes research-driven capacity building to advance knowledge on global environmental change across 26 countries in Africa. START provides research grants and fellowships, facilitates multi-stakeholder dialogues and develops curricula. This opens up opportunities for scientists and development professionals, young people and policy makers to enhance their understanding of the threats posed by climate change. Agriculture production that will simultaneously improve food security and natural resources such as soil and water quality will be key for African countries to achieve the goal of doubling agriculture productivity by 2025. Adoption of Sustainable Intensification (SI) practices in combination has the potential to increase agricultural production while improving soil fertility, reducing GHG emissions and environmental degradation and making smallholders more resilient to climate change or other weather stresses and shocks. Drip irrigation technologies such as bucket drip kits help deliver water to crops effectively with far less effort than hand-watering and for a minimal cost compared to irrigation. In Kenya, through the support of the Kenya Agriculture Research Institute, the use of the drip kit is spreading rapidly and farmers reported profits of US$80-200 with a single bucket kit, depending on the type of vegetable. Risk mitigation tools, such as providing reliable climate information services, insurance policies that pay out to farmers following extreme climate events and social safety net programmes that pay vulnerable households to contribute to public works can boost community resilience. Since 2011 the CGIAR’s Research Programme on Climate Change, Agriculture and Food Security (CCAFS), the Senegalese National Meteorological Agency and the the Union des Radios Associatives et Communautaires du Sénégal, an association of 82 community-based radio stations, have been collaborating to develop climate information services that benefit smallholder farmers. A pilot project was implemented in Kaffrine and by 2015, the project had scaled-up to the rest of the country. Four different types of CI form the basis of advice provided to farmers through SMS and radio: seasonal, 10-day, daily and instant weather forecasts, that allow farmers to adjust their farming practices. In 2014, over 740,000 farm households across Senegal benefitted from these services. While international and continental processes such as the Sustainable Development Goals, COP21 and the Malabo Declaration are crucial for aligning core development objectives and goals, there is often a disconnect between the levels of commitment and implementation on the ground. Now is an opportune time to act. Governments inevitably have many concurrent and often conflicting commitments and hence require clear goals that chart a way forward to deliver on the Malabo Declaration. The 15 success stories discussed in the Montpellier Panel’s briefing paper highlight just some examples that help Africa’s agriculture thrive. As the backbone of African economies, accounting for as much as 40% of total export earnings and employing 60 – 90% of the labour force, agriculture is the sector that will accelerate growth and transform Africa’s economies. With the targets of the Malabo Declaration aimed at 2025 – five years before the SDGs – Africa can now seize the moment and lead the way on the shared agenda of sustainable agricultural development and green economic growth.